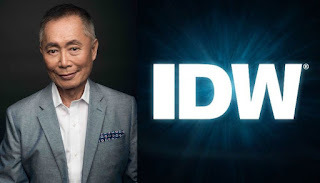 George Takei is partnering with IDW Publishing to create a graphic novel that will explore the true story of Japanese American internment camps during WWII as remembered through the eyes of young George. IDW Publishing said "Takei was only five years old when President Roosevelt signed Executive Order 9066 shortly after the bombing of Pearl Harbor, authorizing the internment of Japanese Americans. As a result, 120,000 innocent citizens, including Takei and his family, were rounded up without any charges or due process—they were guilty of nothing but looking like the people who bombed Pearl Harbor. This graphic novel will explore these events through the eyes of young George, and how this shaped him to become the humanitarian he is today; a proud American and a vocal activist against intolerance in all its forms, lending his influential voice to the voiceless." He added "I have spoken publicly on numerous occasions during my life on the unjust internment of Japanese Americans in my ongoing mission of spreading awareness of this disgraceful chapter of American history. I do this, and will continue to do so, in the hope that my personal experience can serve as a cautionary reminder of our past leaders’ mistakes, and that as a society, we can learn from those transgressions and not repeat them. When the opportunity to tell my story in the form of a graphic novel presented itself, I recognized the value in making it easily accessible for our youth to discover and digest the material, bringing attention to an important and relevant issue, while preserving it for generations to come. We live in uncertain times, and if stories such as mine can inspire us to do better and encourage positive change, I want to share it with as many people as possible, no matter who they are, or where they come from."